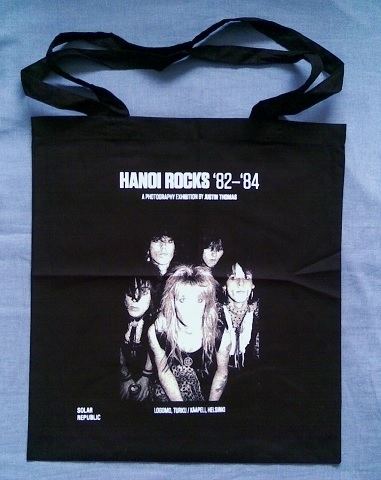 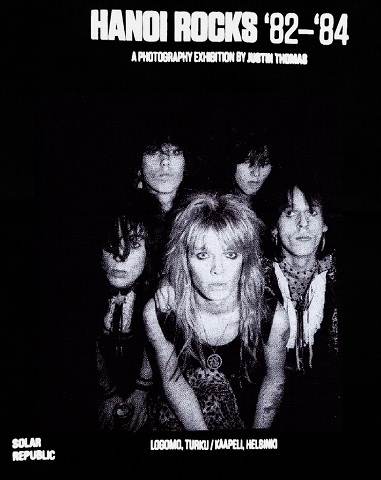 Hanoi Rocks '82-'84 ~ A Photography Exhibition by Justin Thomas Cotton Tote Bag. 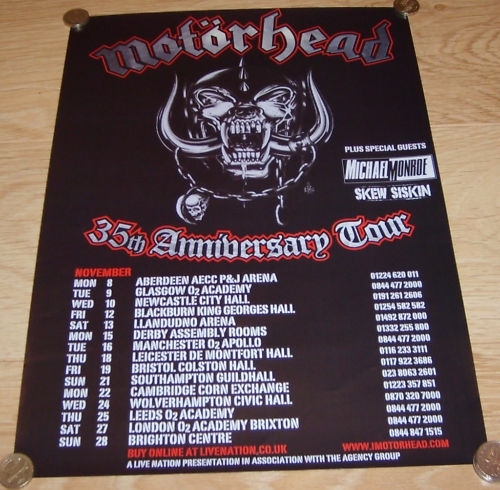 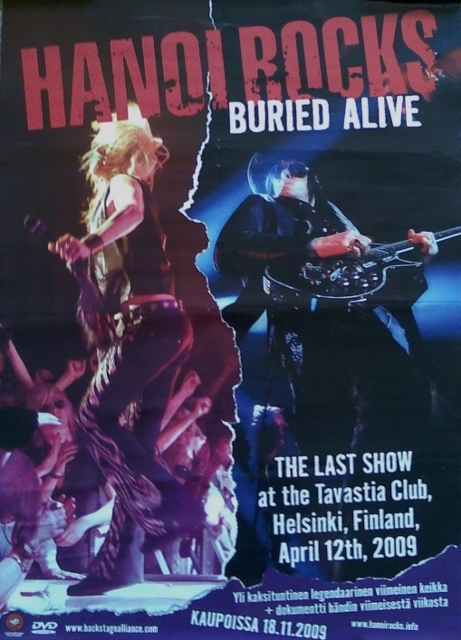 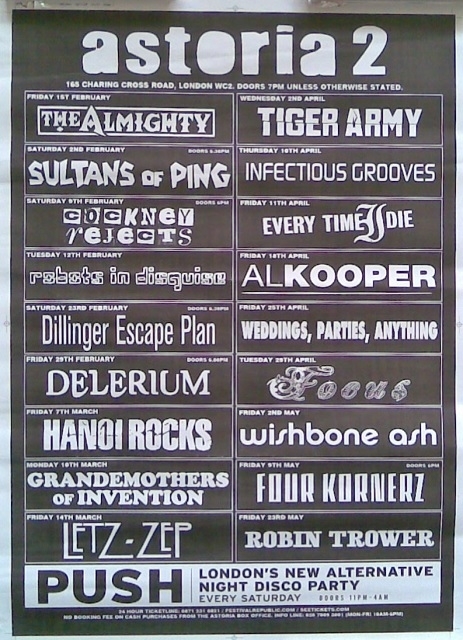 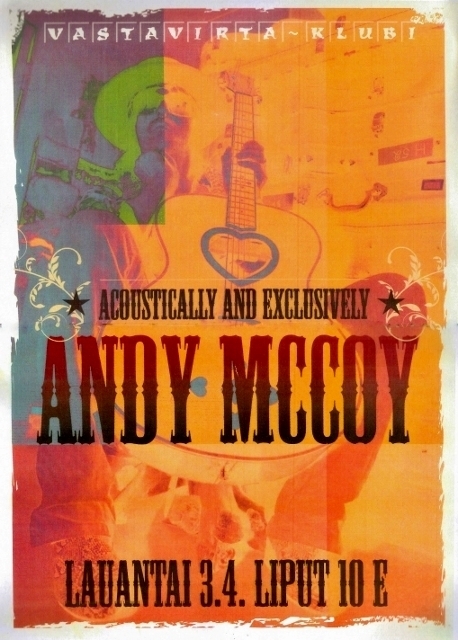 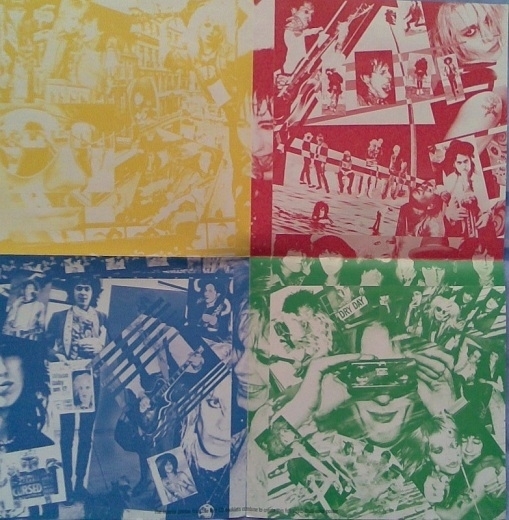 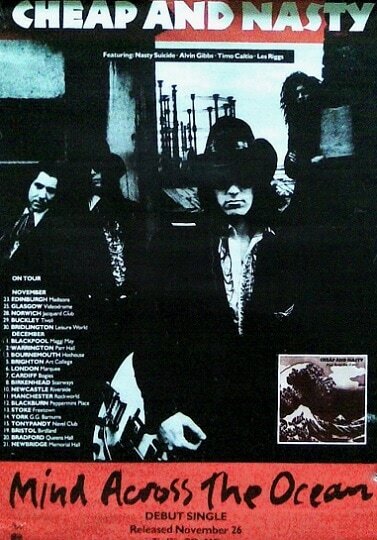 This is a gallery of original gig,tour & promo posters from my collection. 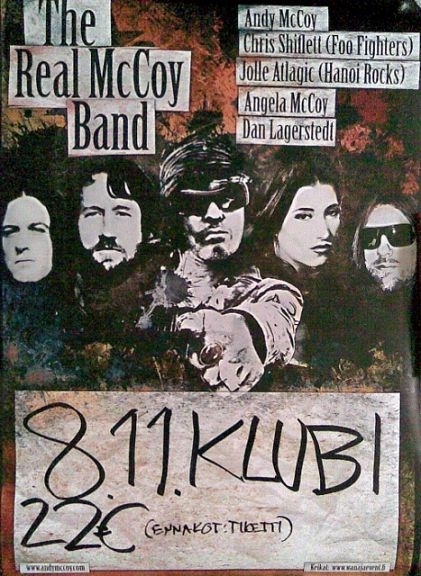 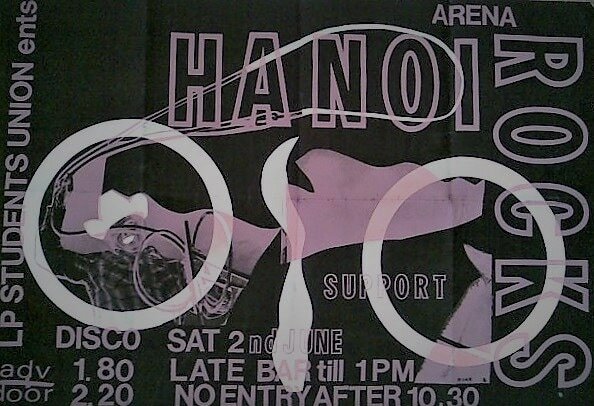 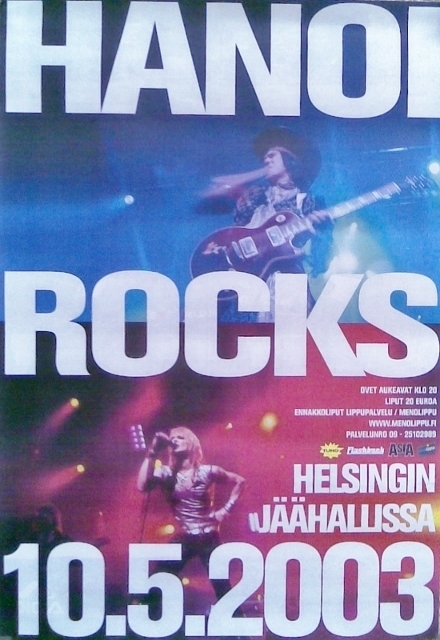 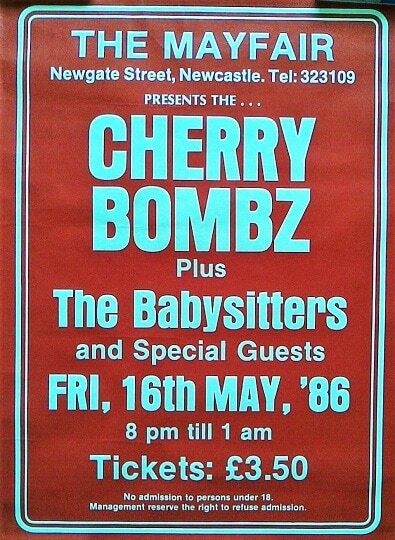 This poster is not a copy or reproduction,as far as I know there never was an original poster for this concert. 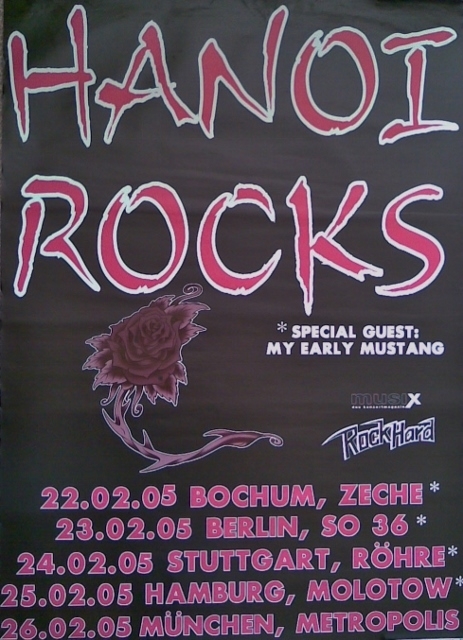 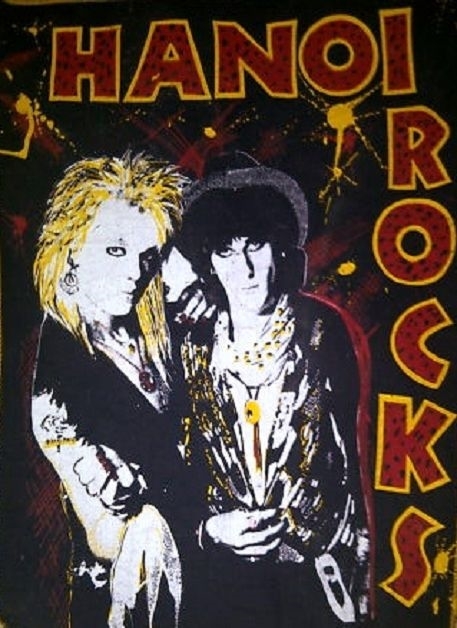 This is a modern hand made poster from artist Dean Tomasek to commemorate what would've been Hanoi Rocks Los Angeles debut 30 years ago.The gig never took place due to the death of Razzle 6 days earlier. 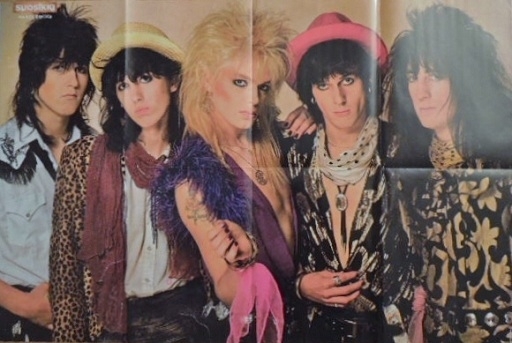 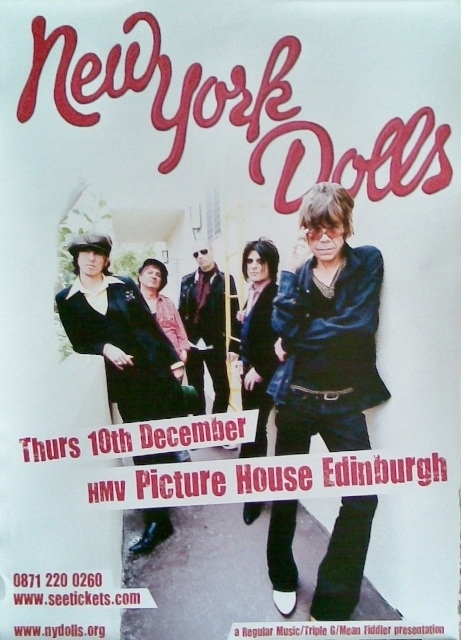 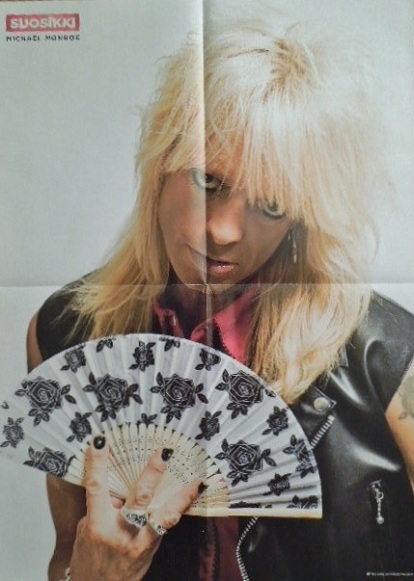 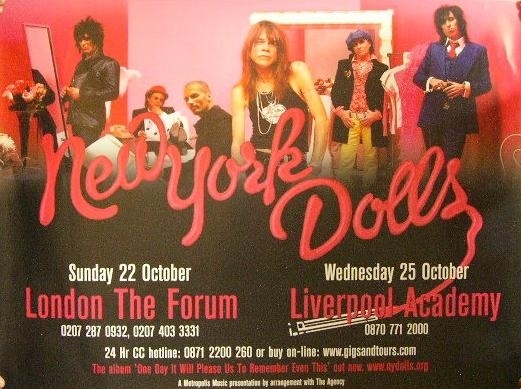 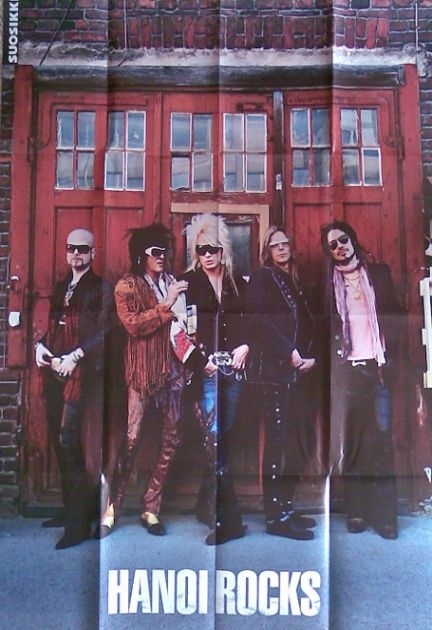 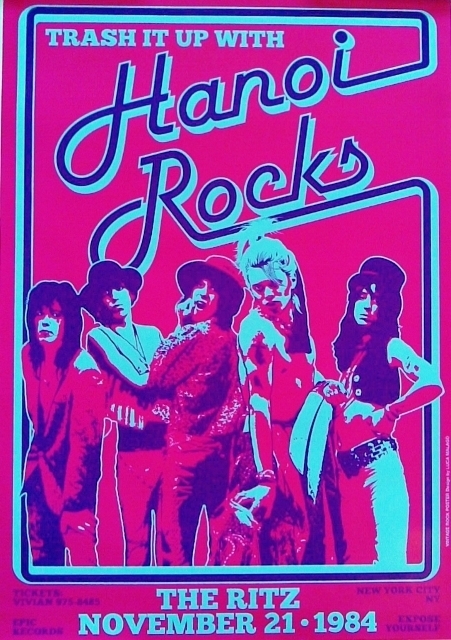 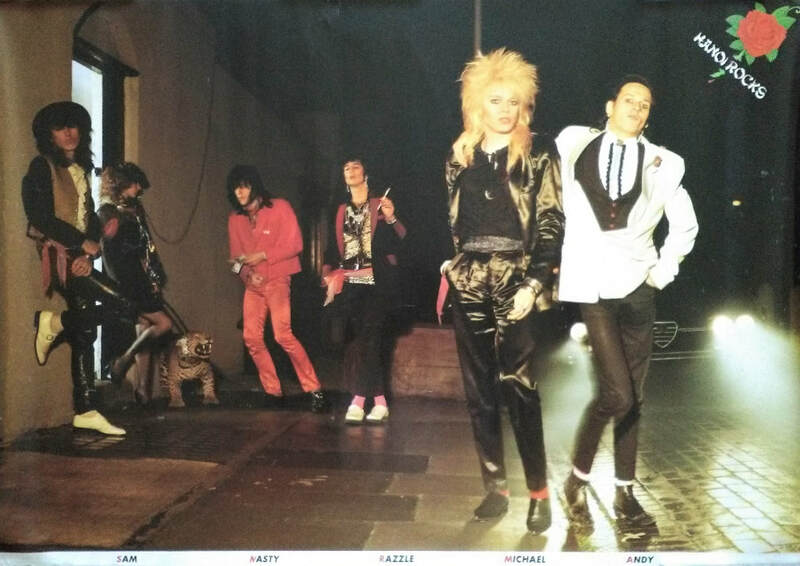 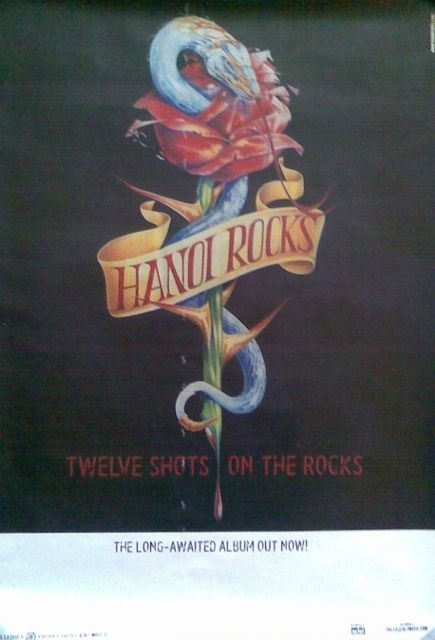 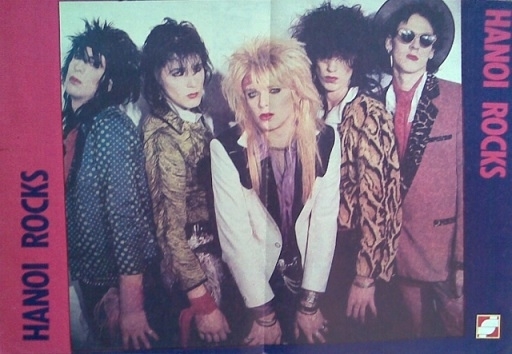 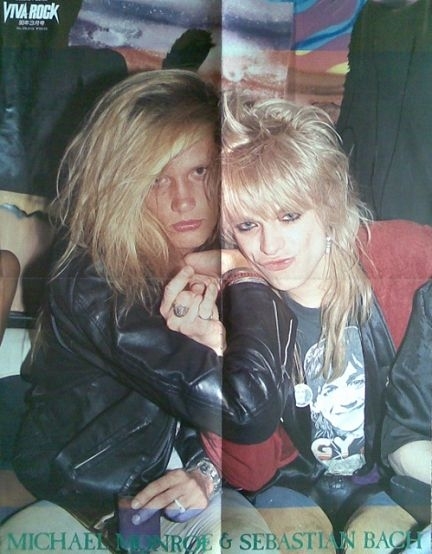 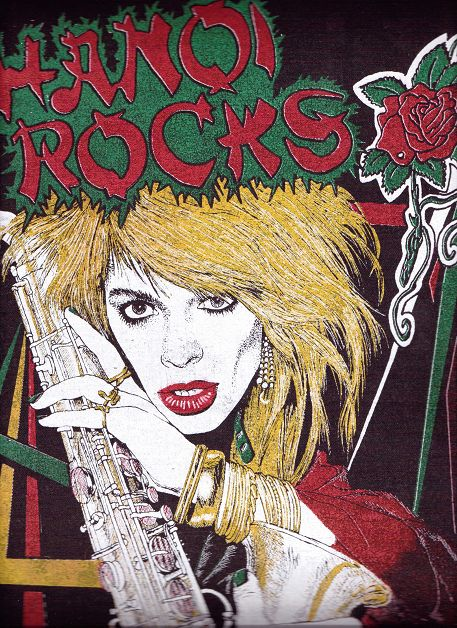 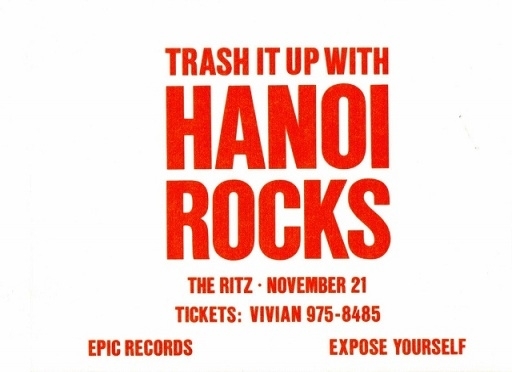 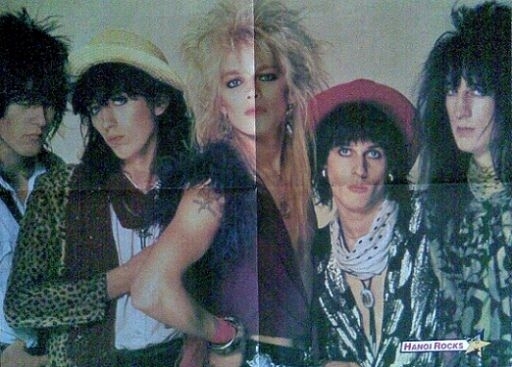 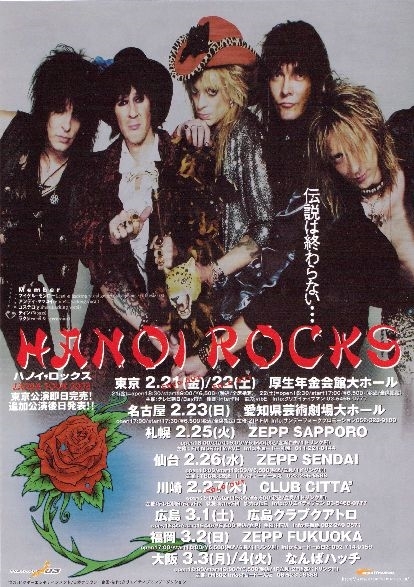 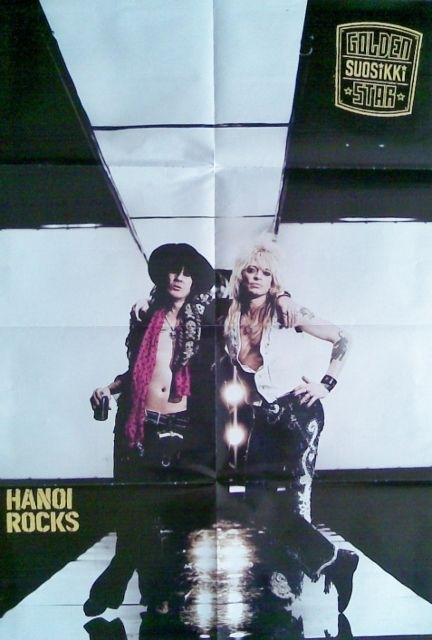 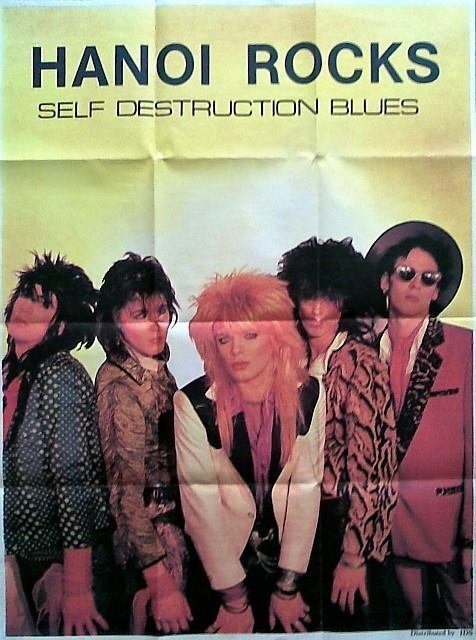 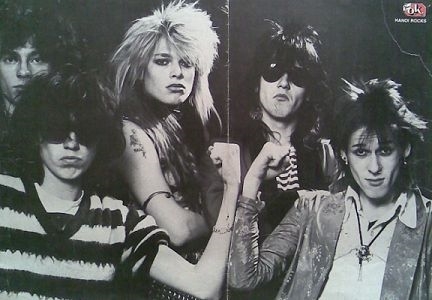 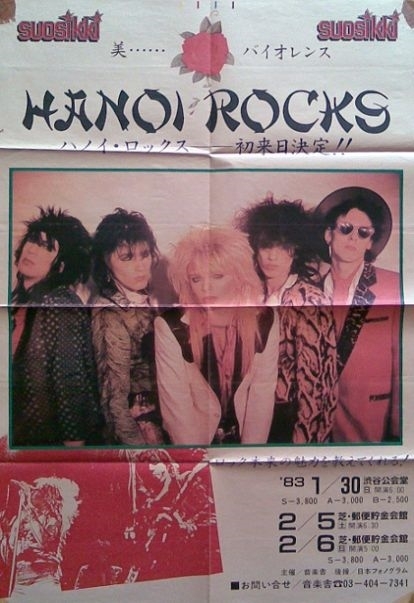 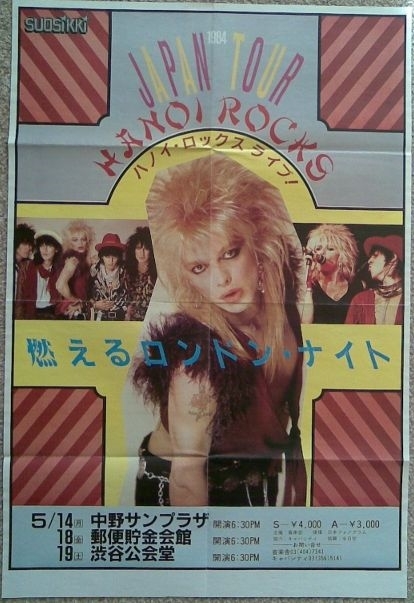 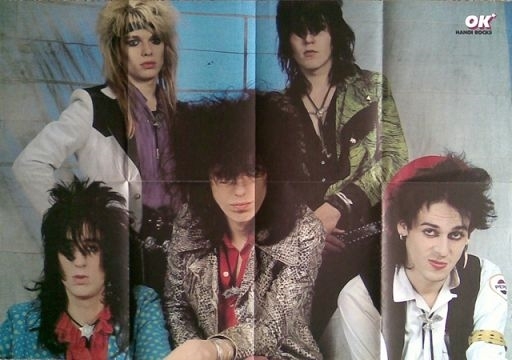 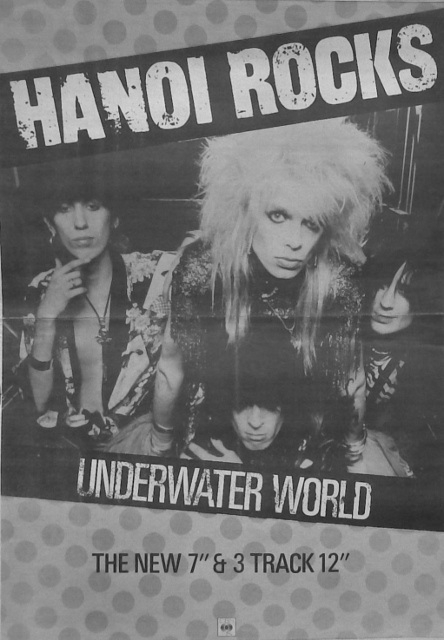 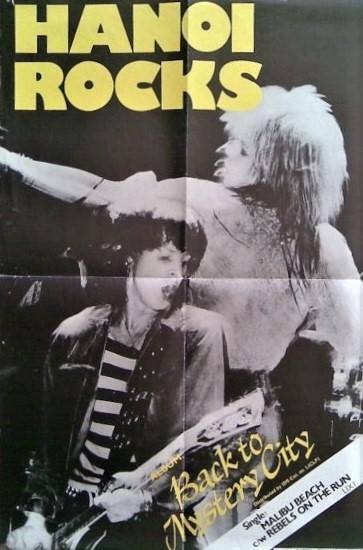 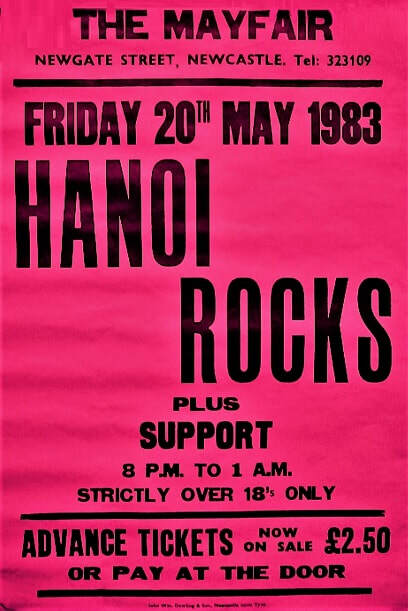 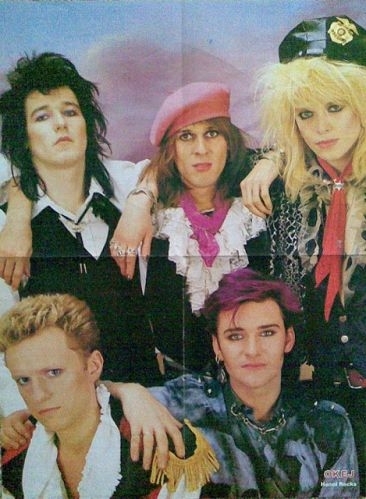 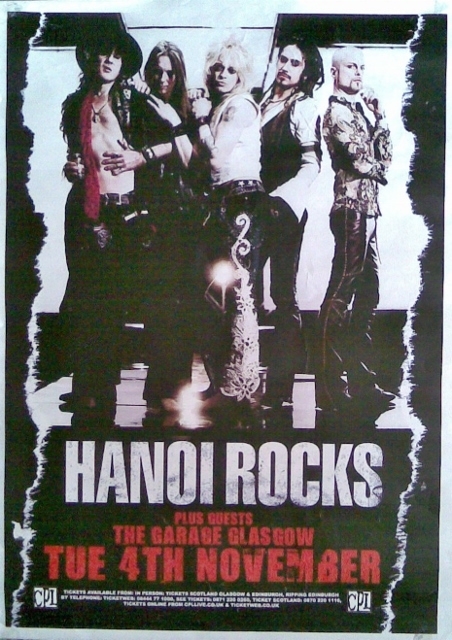 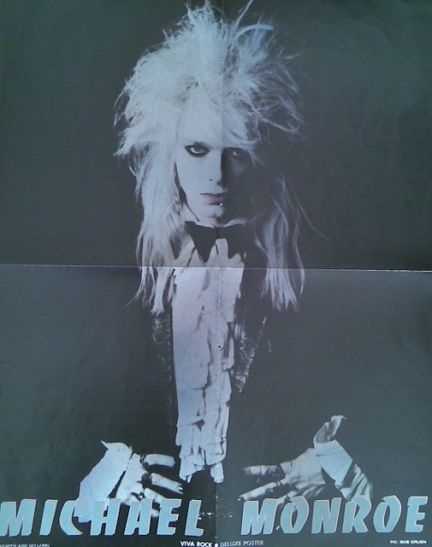 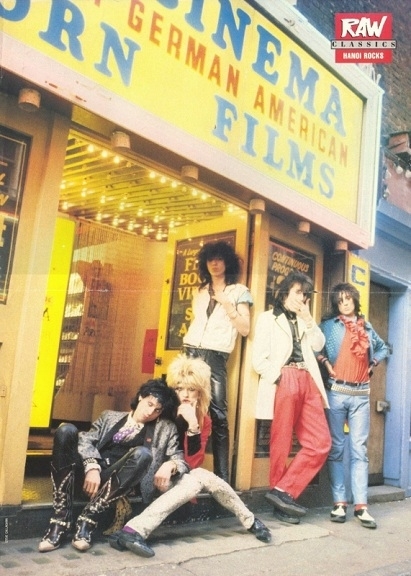 Commemorative Poster for the Hanoi Rocks New York Ritz Gig on 21st November 1984. 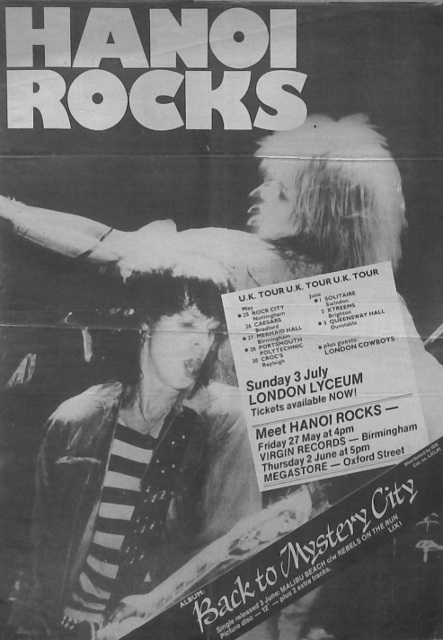 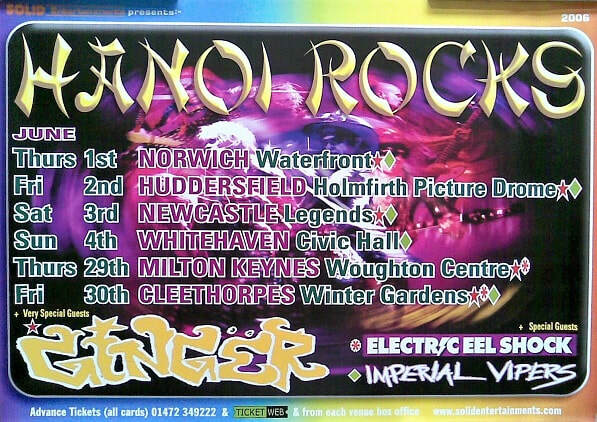 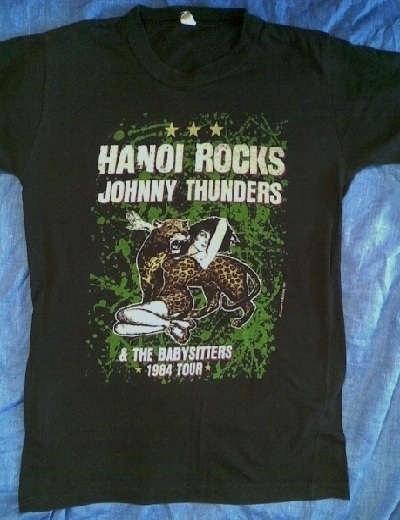 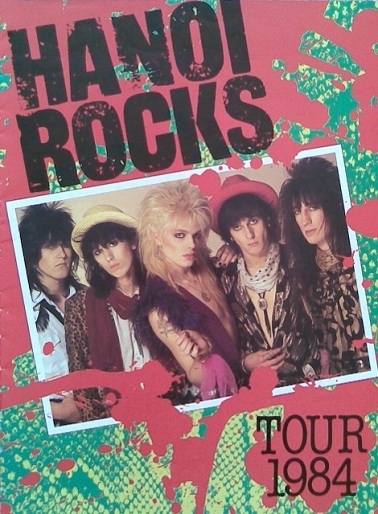 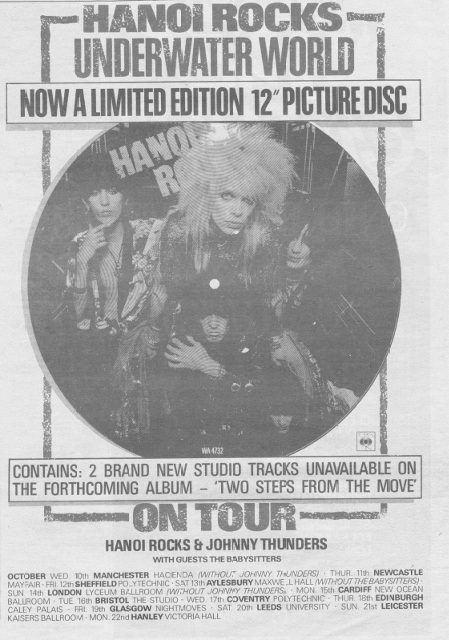 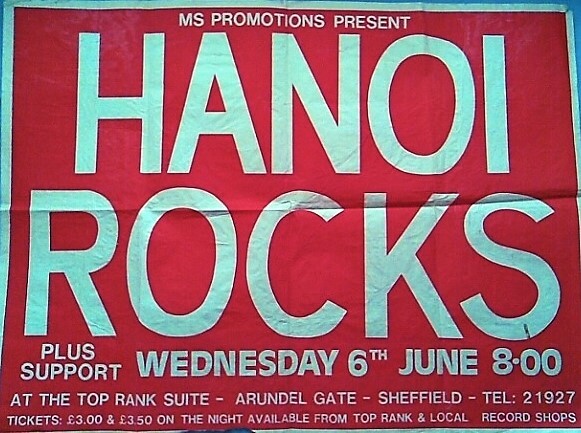 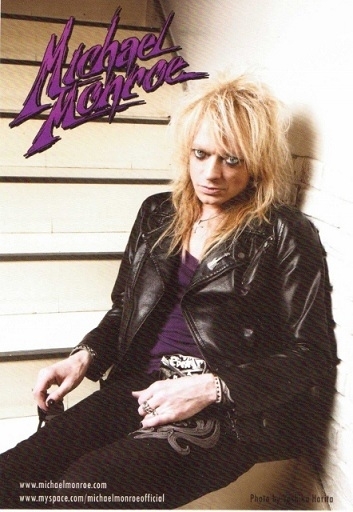 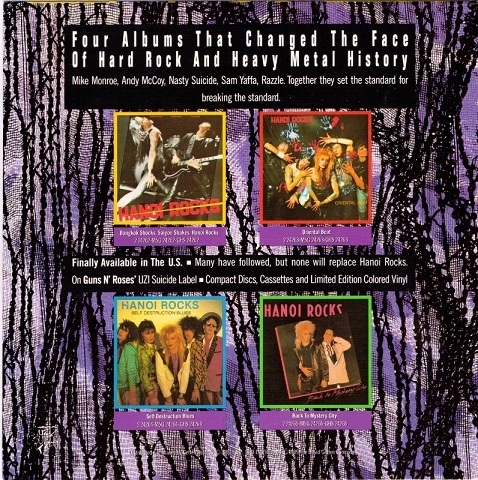 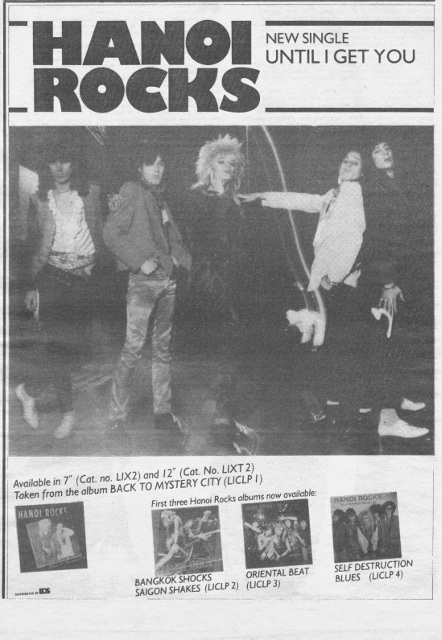 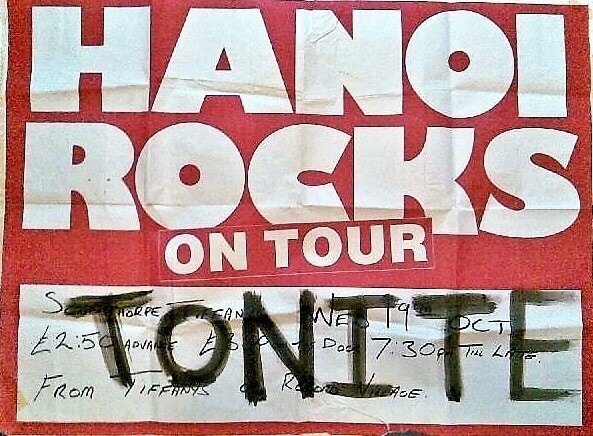 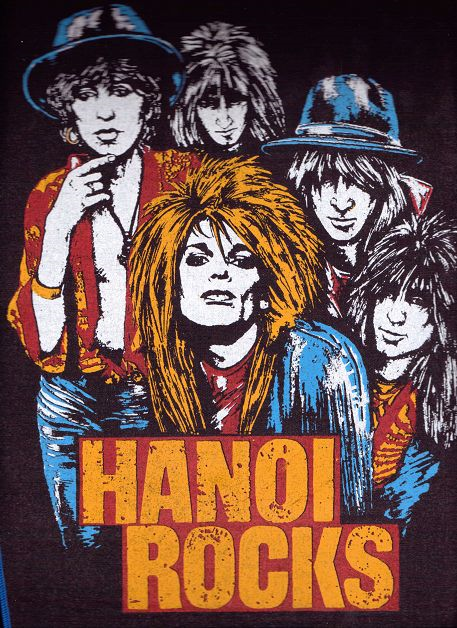 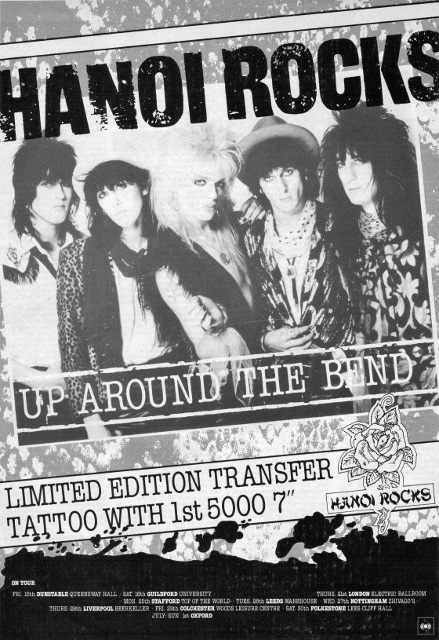 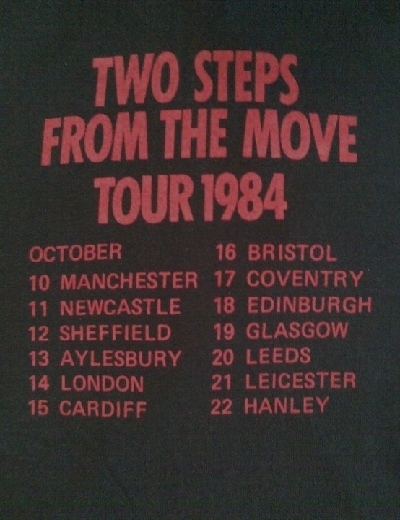 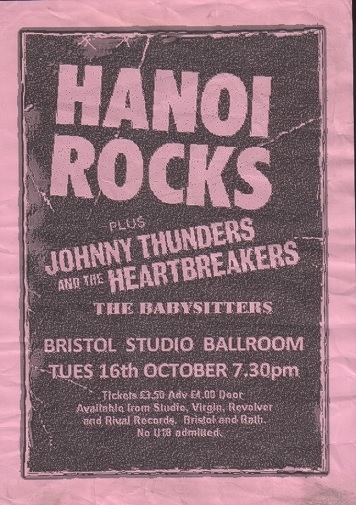 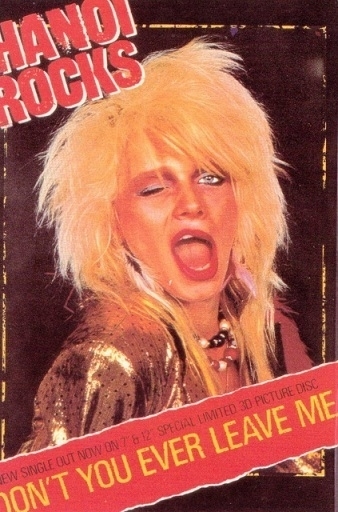 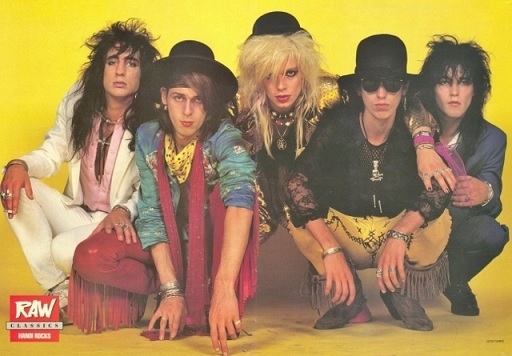 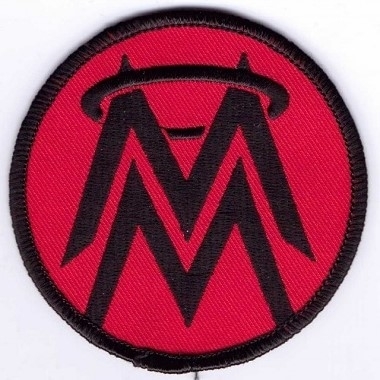 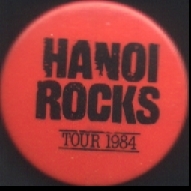 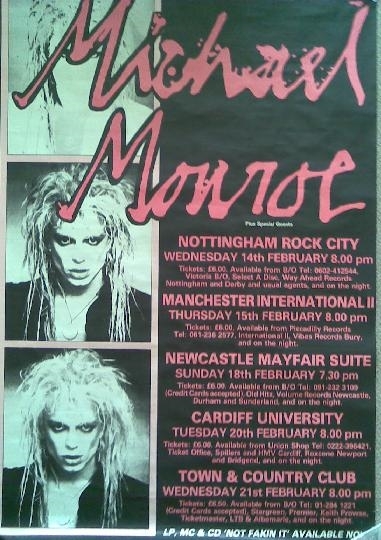 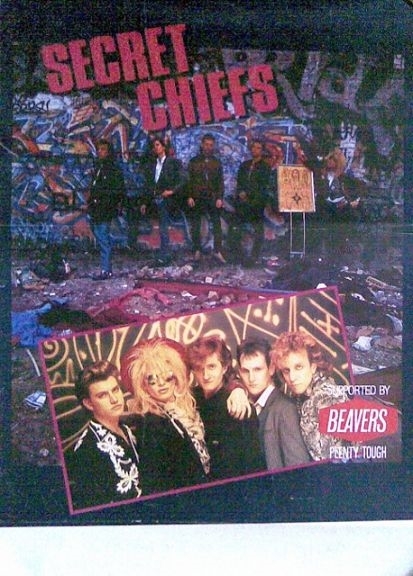 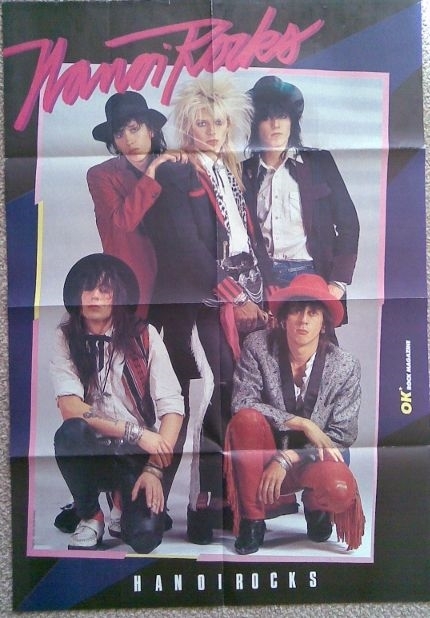 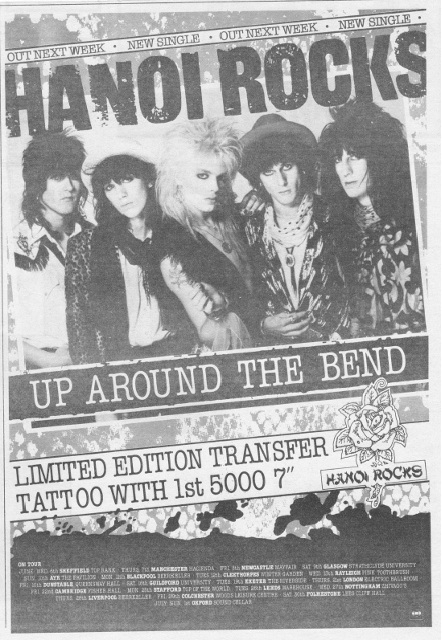 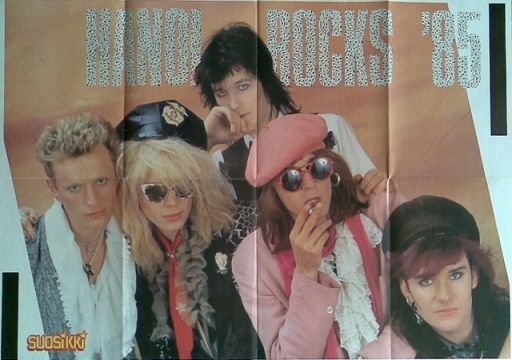 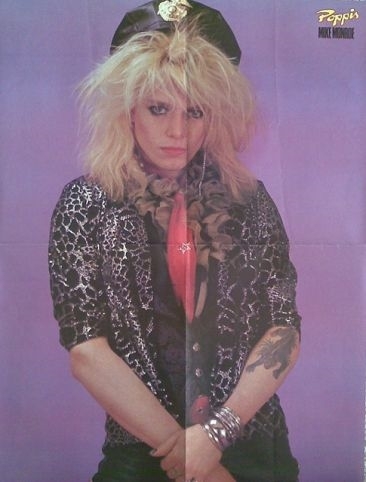 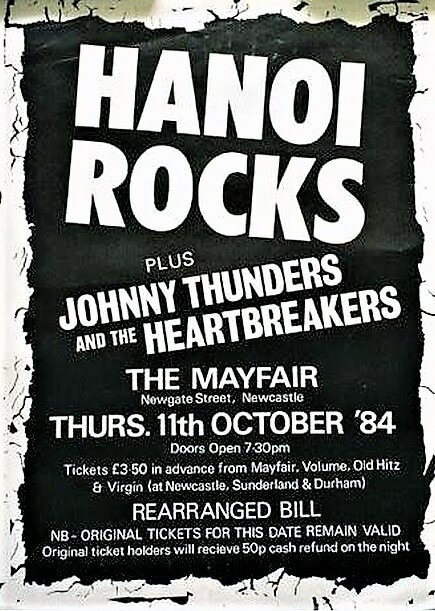 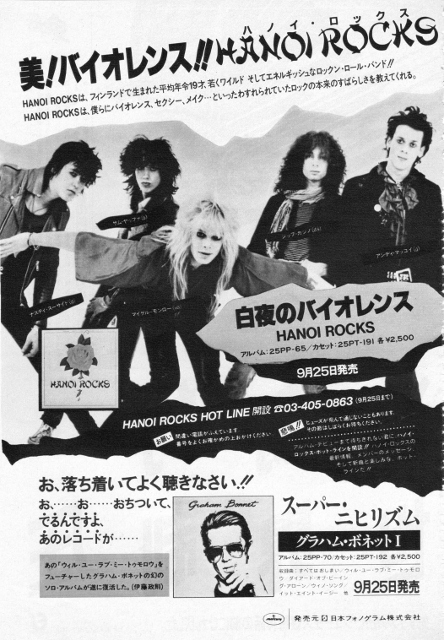 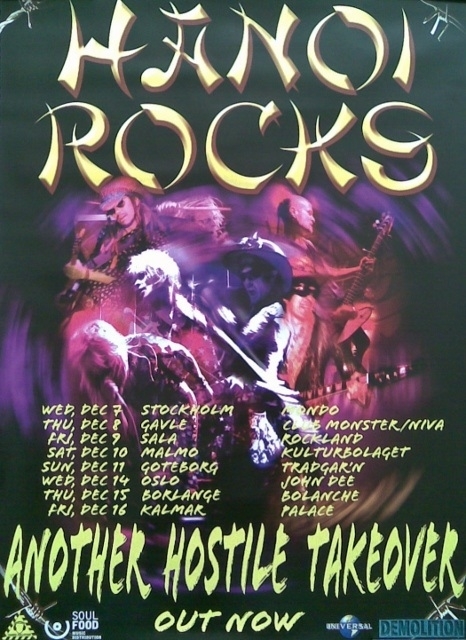 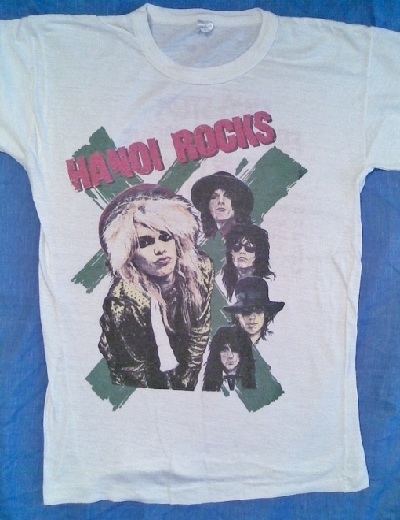 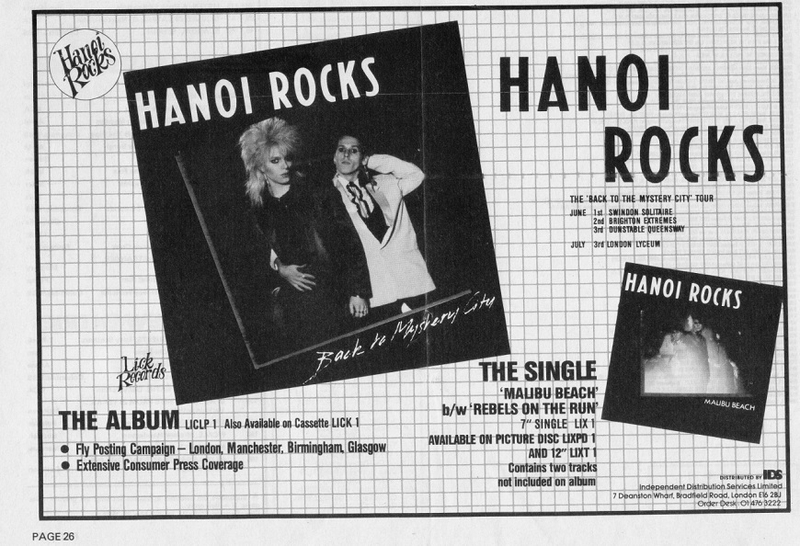 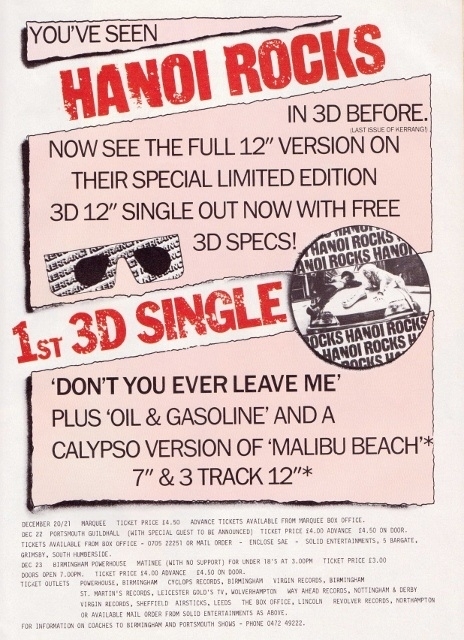 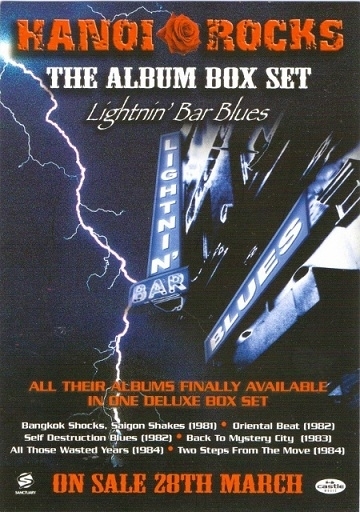 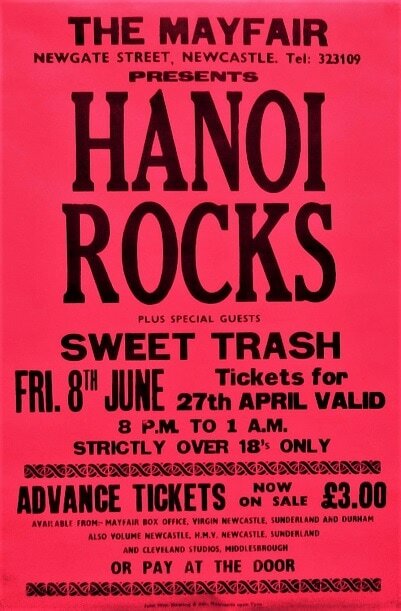 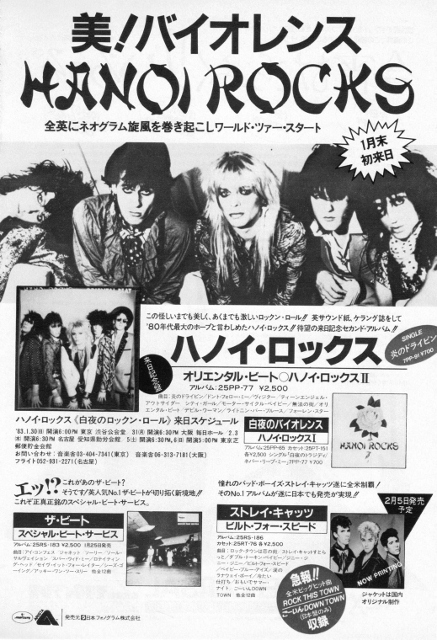 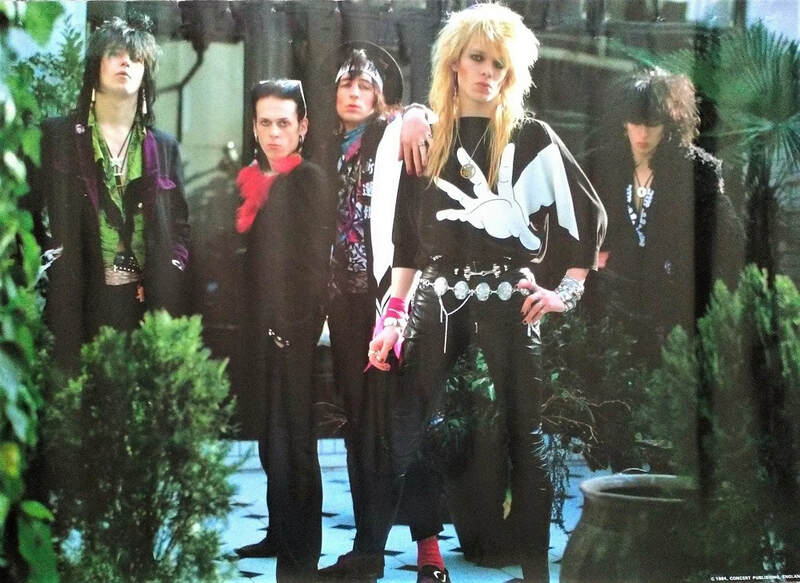 In 1984 Hanoi Rocks did two extensive U.K tours,the first in June and the second the "Two Steps from the Move" 13 day tour with Johnny Thunders & the Heartbreakers and the Babysitters.This is a gallery of merchandise available from both of the tours. 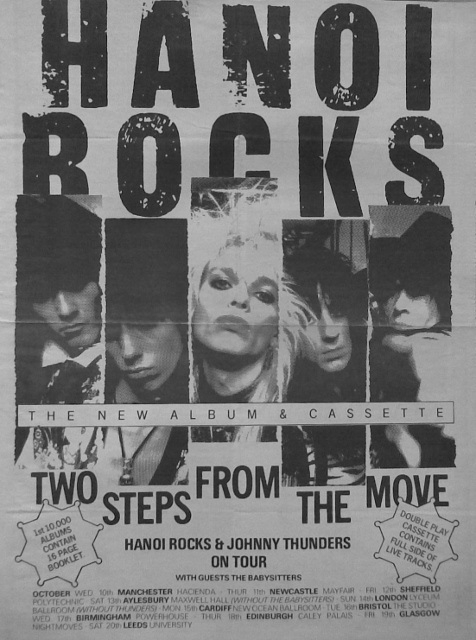 1984 Two Steps From The Move 2 sided LP promo flat.These are 12"x12" card displays that were sent out to record shops to promote the LP. 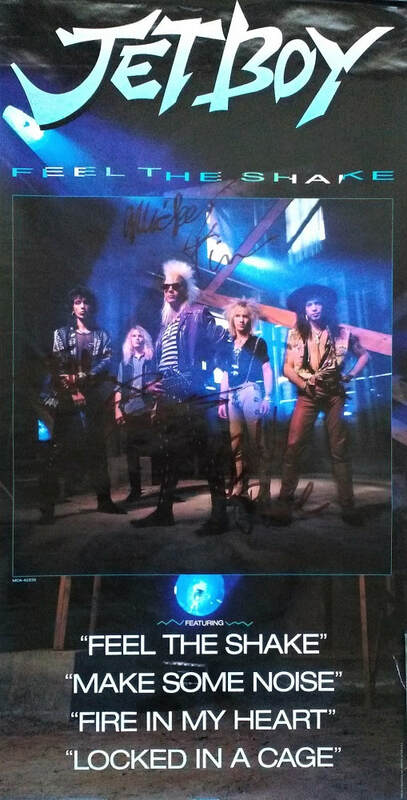 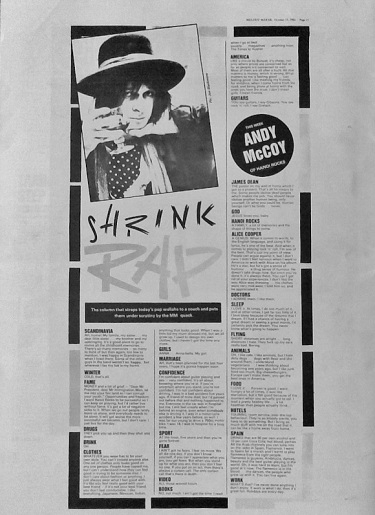 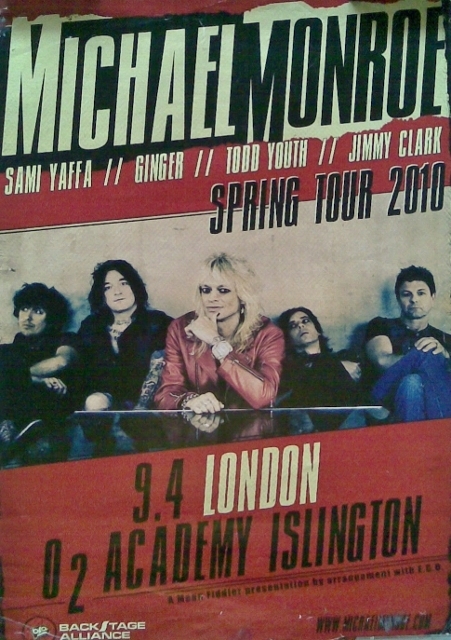 Signed by Mike,Andy,Nasty,Sam & Razzle Backstage at New York Ritz,U.S.A. 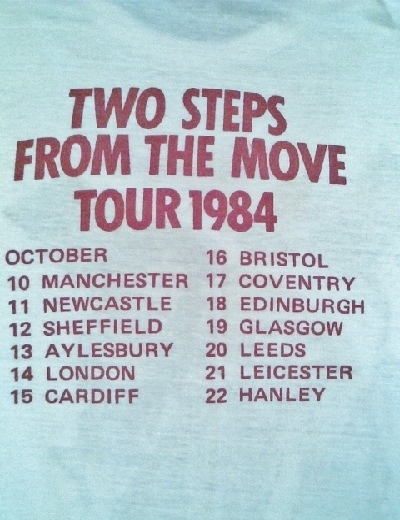 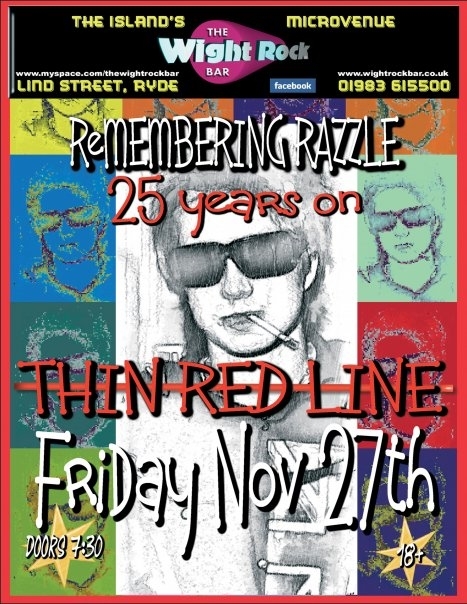 21st November 1984. 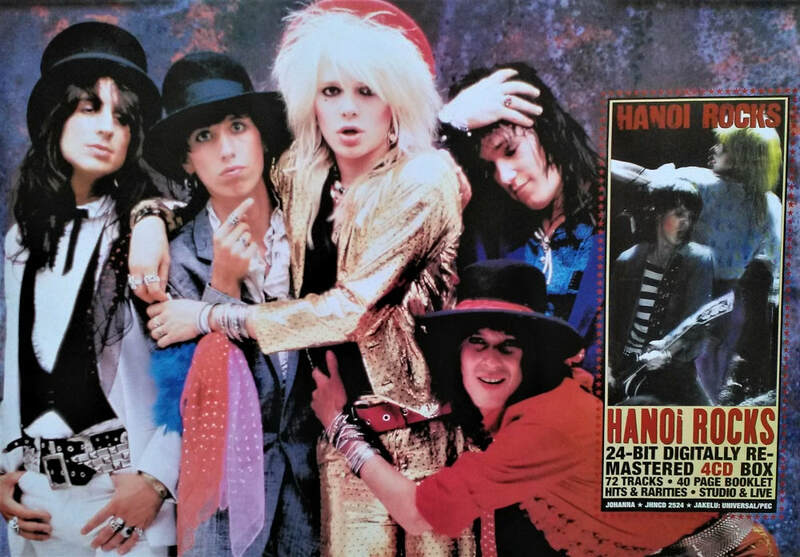 Hanoi Rocks original publicity promo photo plate negatives.These are the original negatives that all the promotional prints were made from. 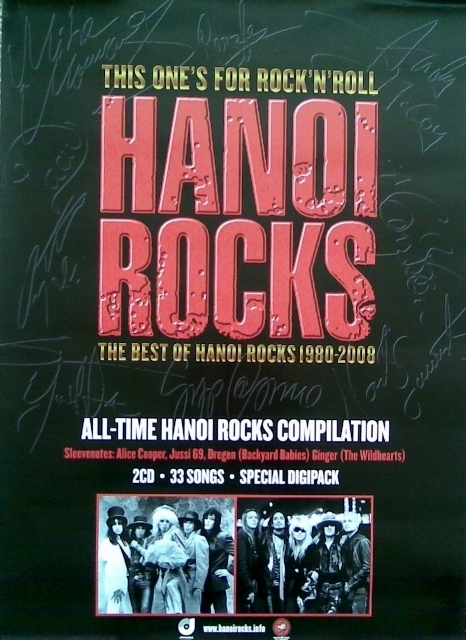 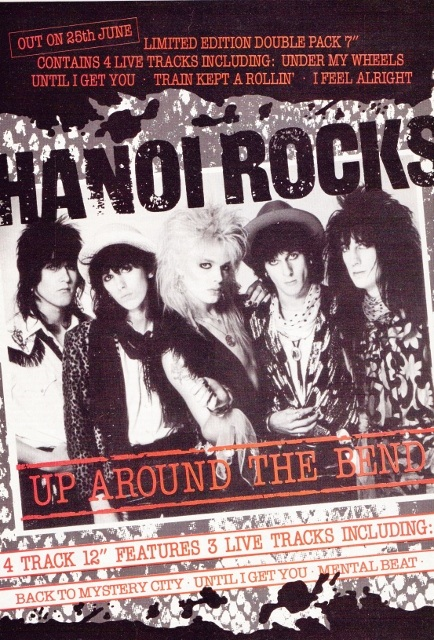 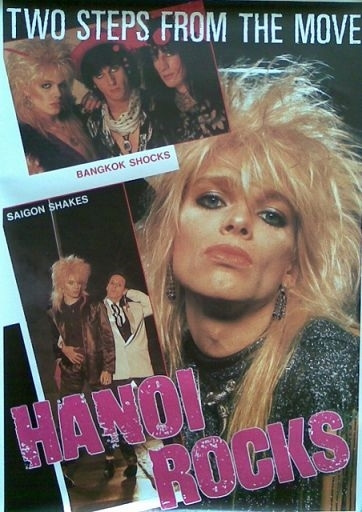 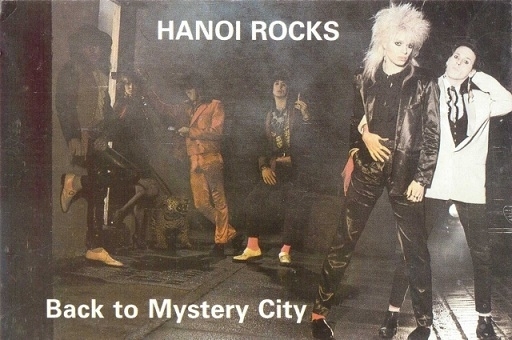 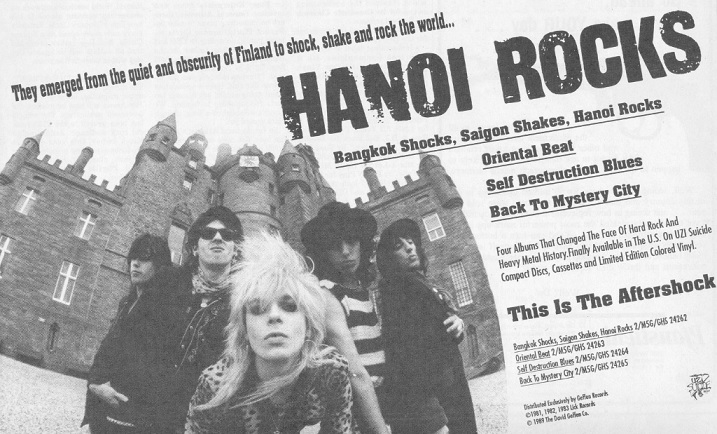 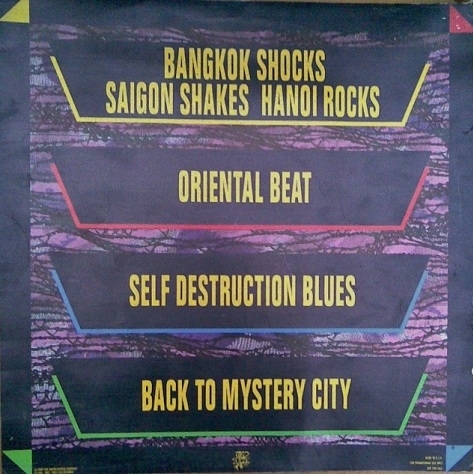 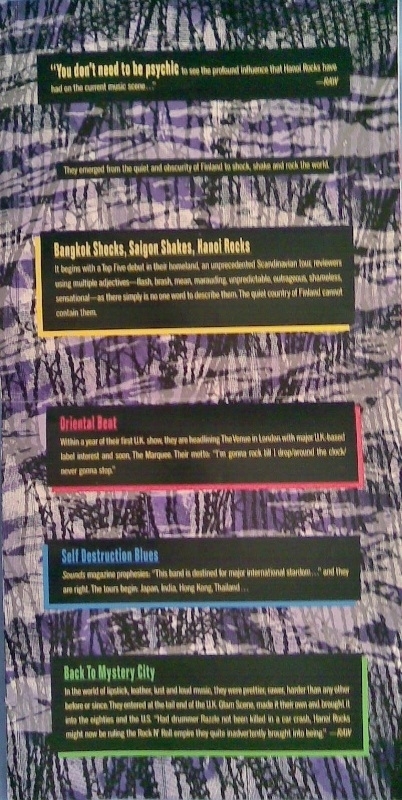 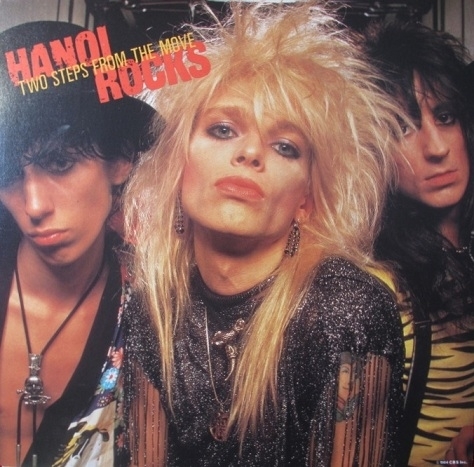 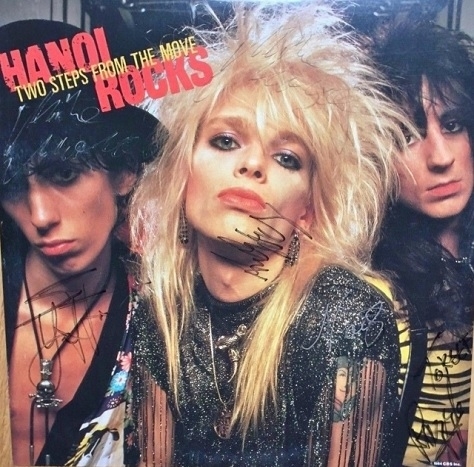 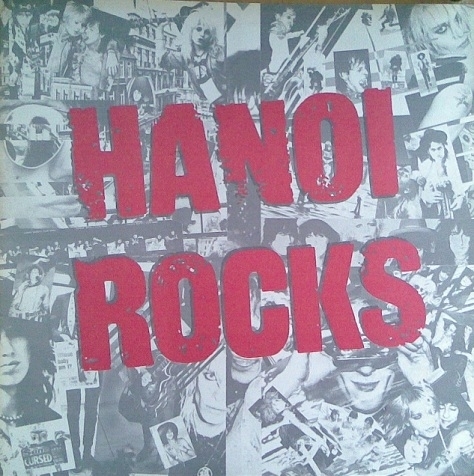 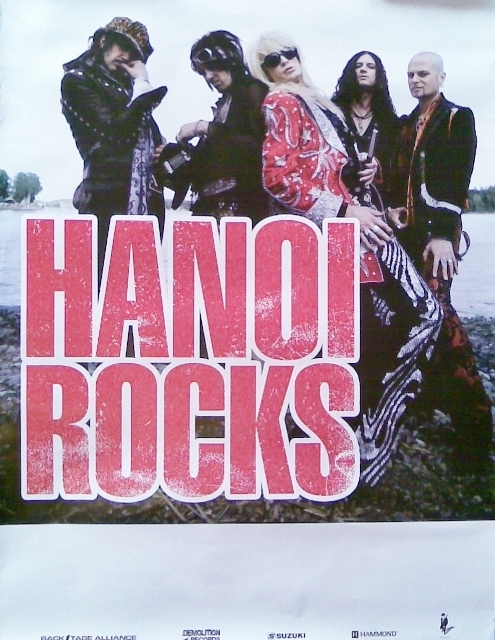 Hanoi Rocks Two Steps from the Move/Bangkok Shocks,Saigon Shakes,Hanoi Rocks mug. 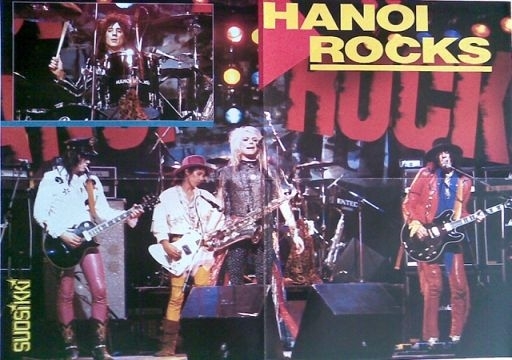 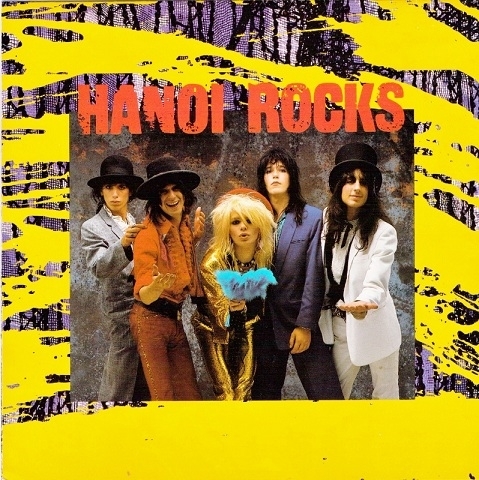 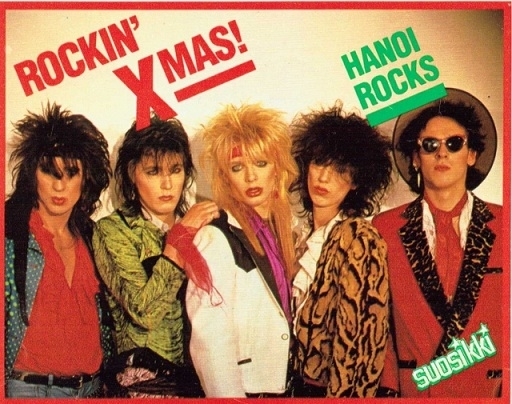 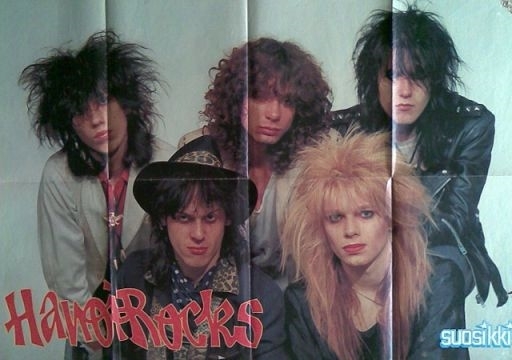 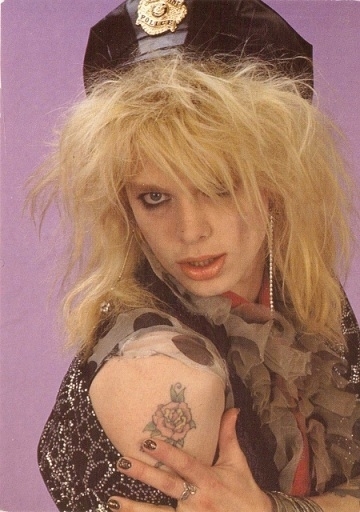 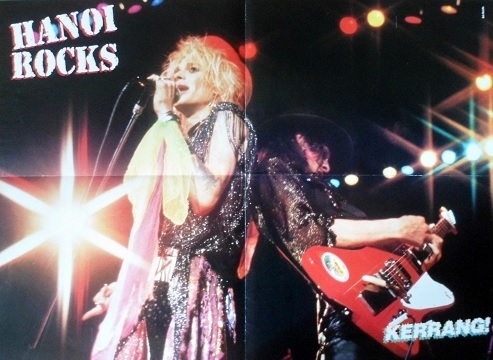 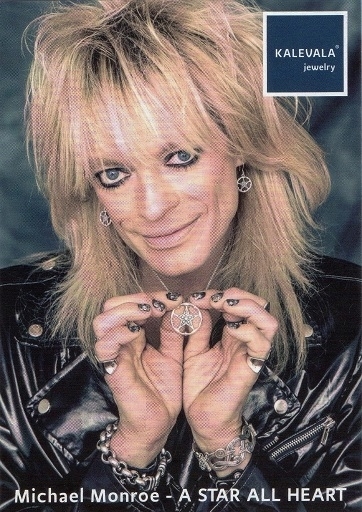 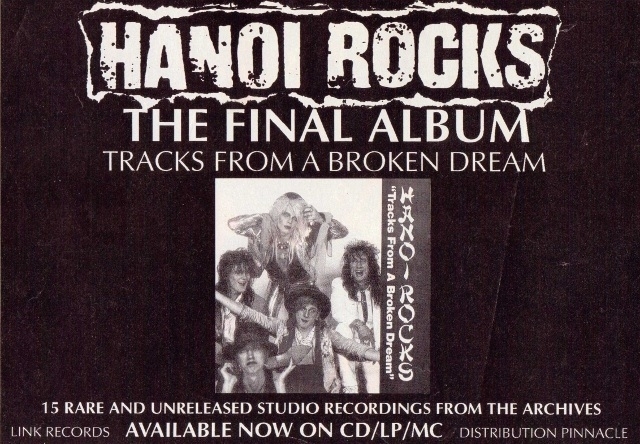 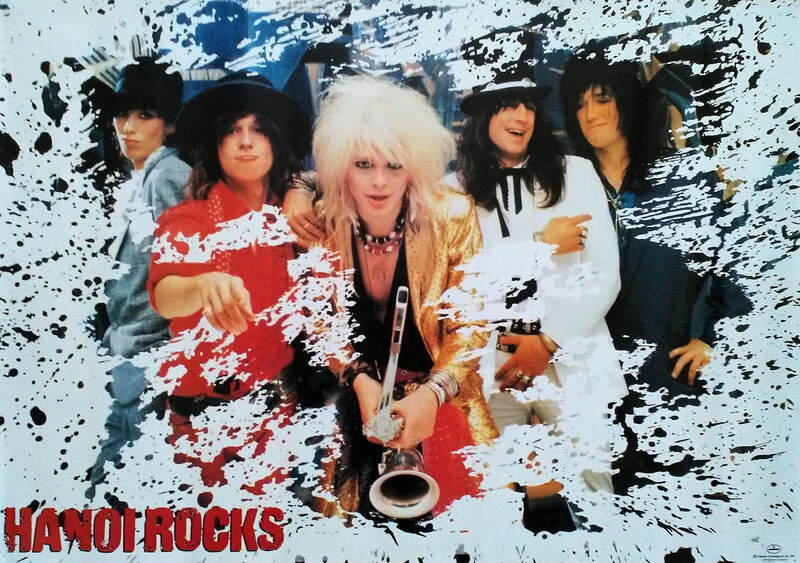 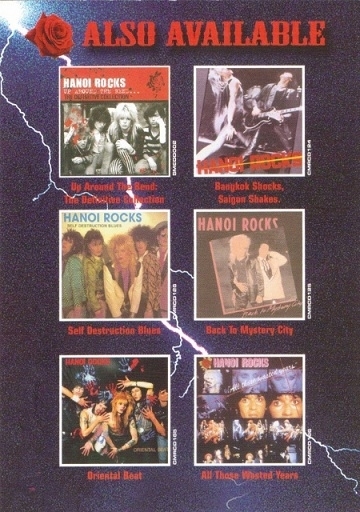 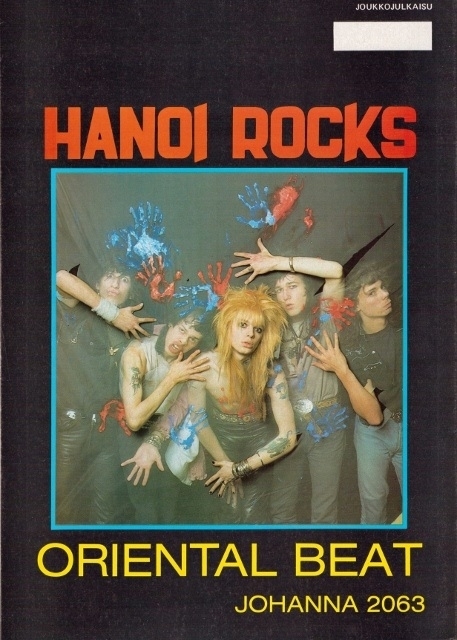 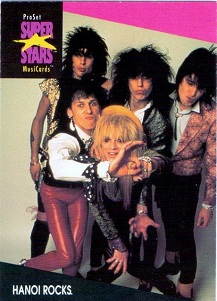 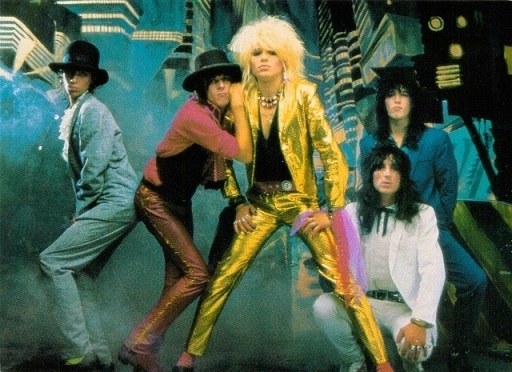 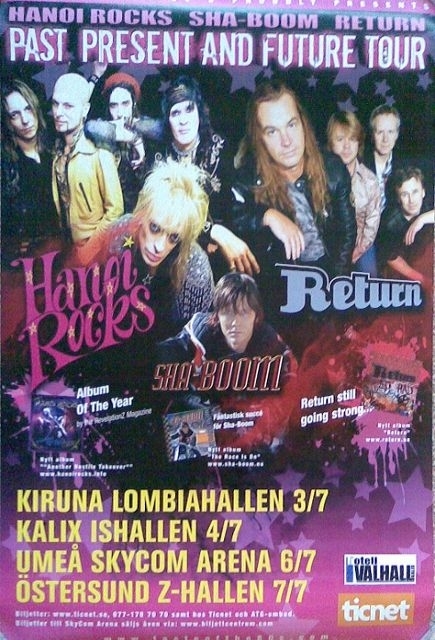 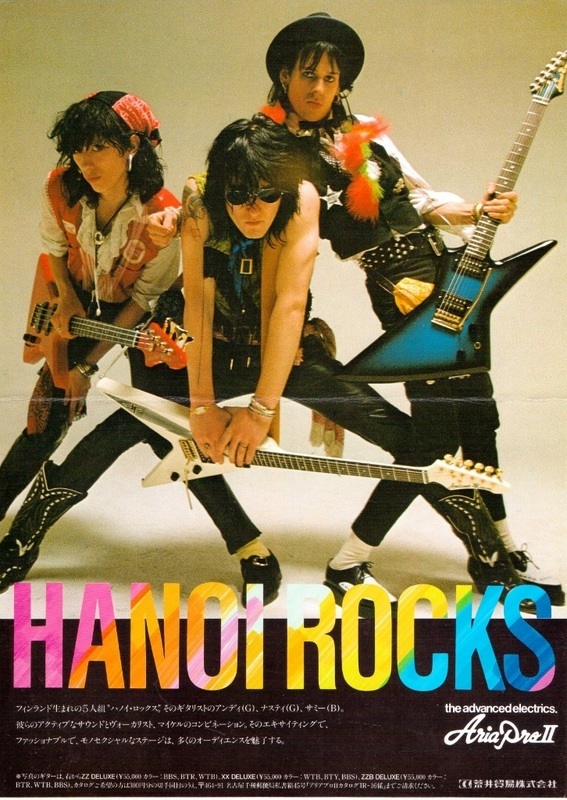 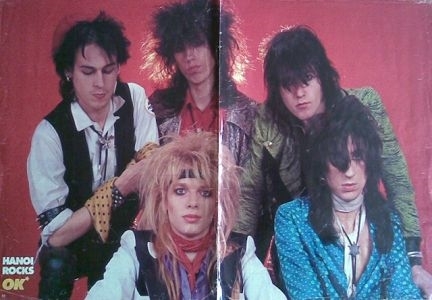 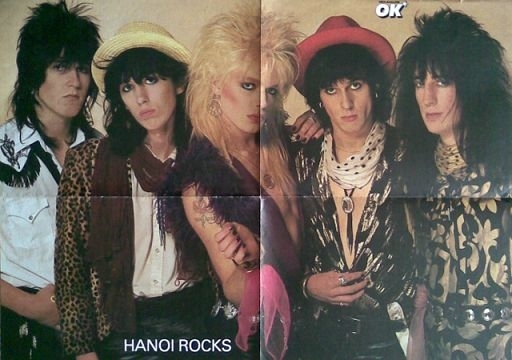 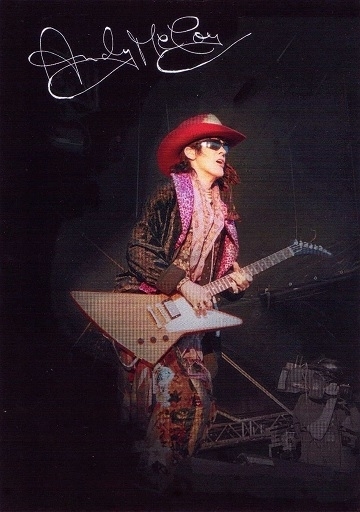 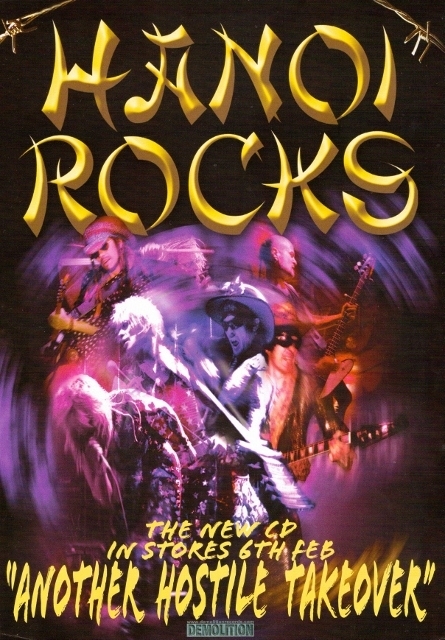 U.S Hanoi Rocks trading cards produced by 'ProSet SuperStars MusiCards' in 1991.Two Hanoi Rocks cards were produced for the series. 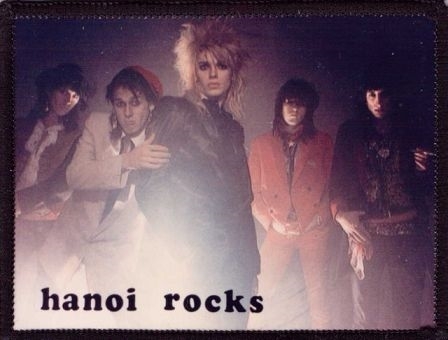 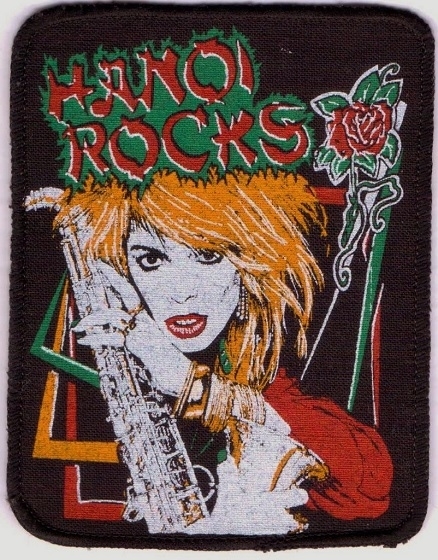 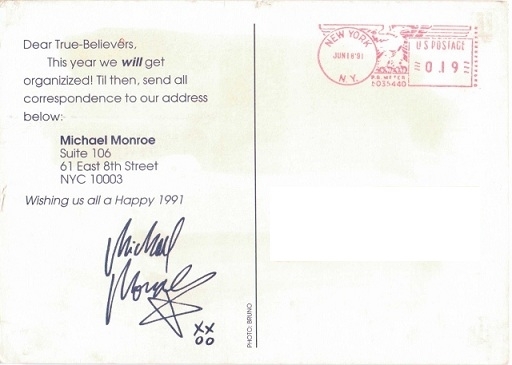 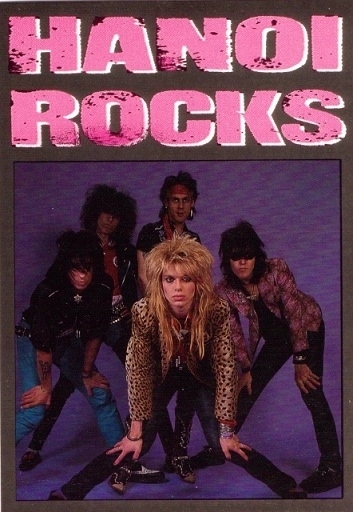 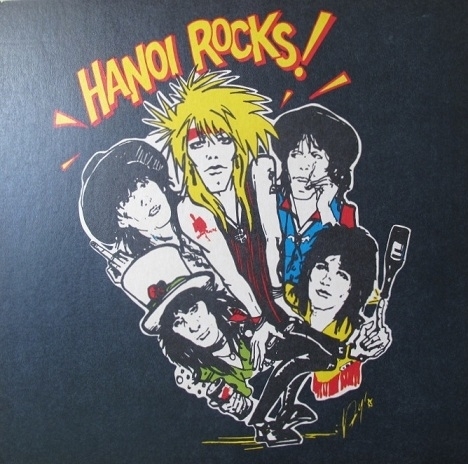 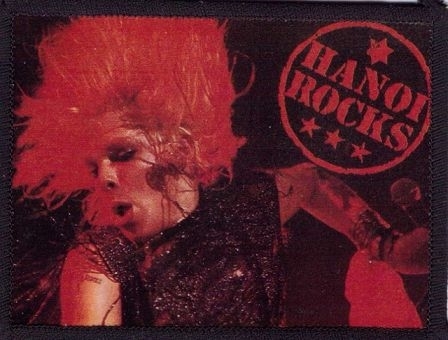 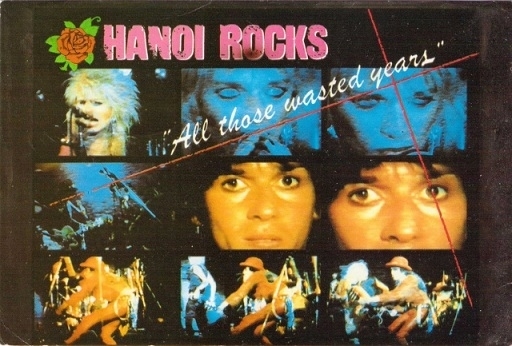 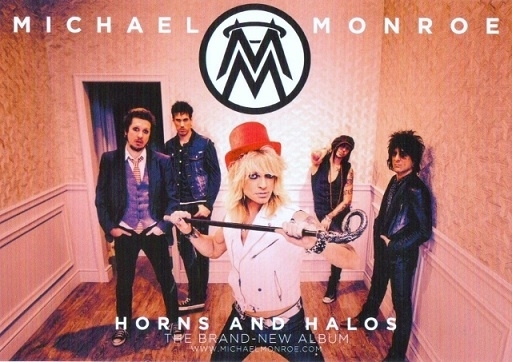 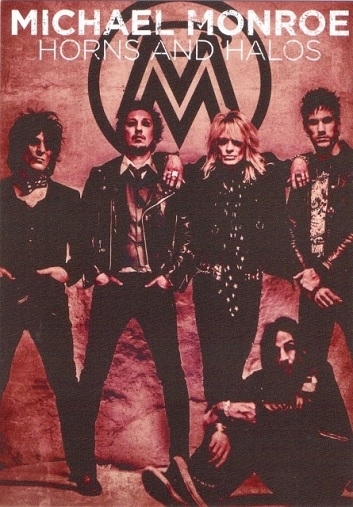 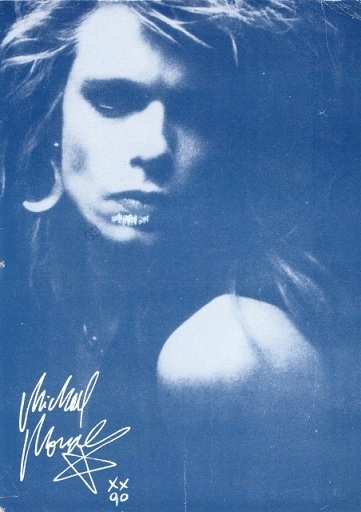 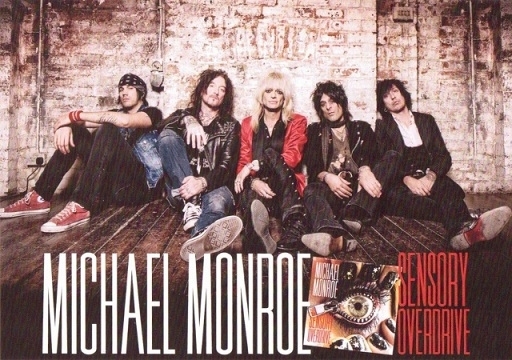 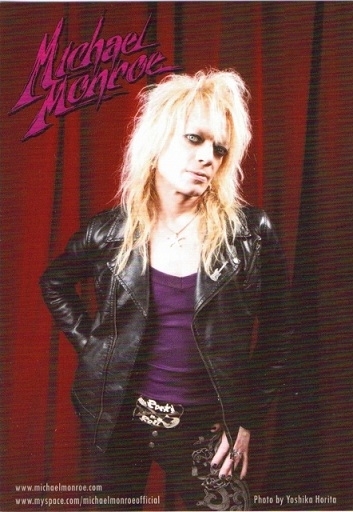 Dutch Hanoi Rocks trading card produced by 'Monty' in 1988. 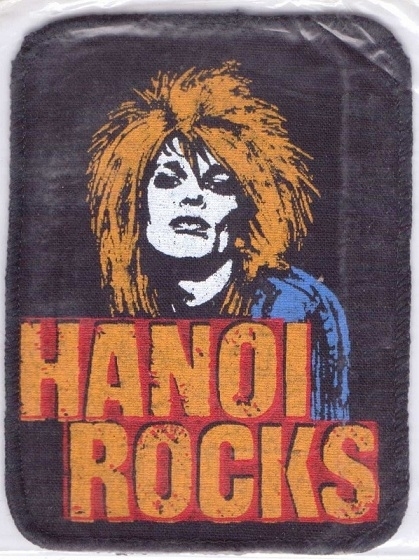 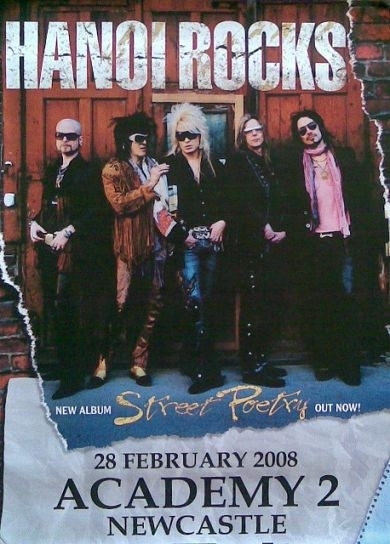 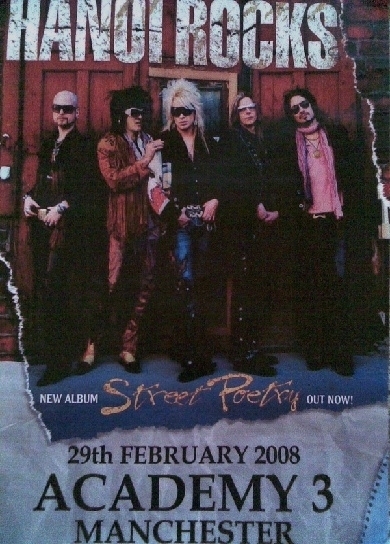 Hanoi Rocks "Street Poetry" Promotional Beer Mat.A very limited amount were made. 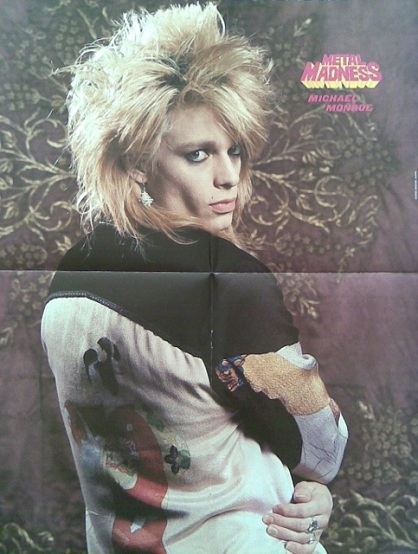 All images are from my personal collection and are not to be reproduced without permission on other websites including Facebook.